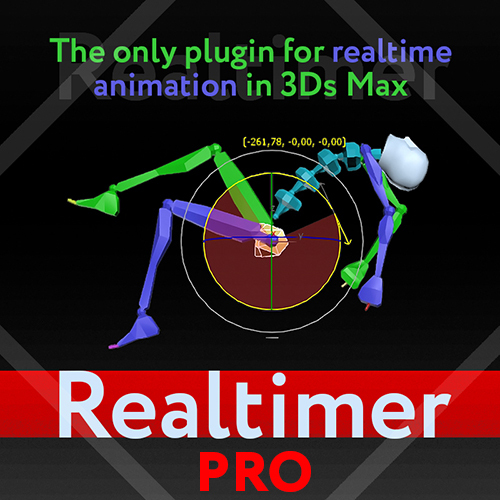 The Realtimer plugin allows you to capture your object manipulations as an animation with ability to change smoothness and speed. You can record it slow for more accuracy or you can make it fast as a timelapse. Use your imagination faster than ever before. It's an animation by your rules! Watch trailer for more details. (NEW)On sale from now till the end of the year! Check it out. Fast Animation Surface Tool Inspired by what Pixar showed on Presto, this tool will really speed up your rigging workflow, but most of all your animation efficiency. You don't need anymore to create additional object to control your rigs, everything is triggered by predefined mesh zones and your mouse movements. So the advantage here is that it doesn't slowdown your scene by adding more elements, and most of all, you can control your rig directly on the mesh, without any visual interference, painful Controller selection or separate UI. So everything becomes very obvious and intuitive. The AdvArray modifier is an advanced parametric array type modifier for Autodesk 3ds Max. Being that 3ds Max does not ship with any sort of parametric array modifier, I’ve programmed this modifier to fill that void as well as add a number of advanced array features not found in 3ds Max by default, and even some that cannot be found in other third party modifiers. OverMorpher PoseSpace is a 3Dsmax plugin dedicated to Pose Space Deformation. It is pretty similar to the SkinMorph, Corrective poses driven by your Rig. Except the poses interpolation is more reliable. The SkinMorph modifier drives the poses depending on the angle between 2 bones. That’s a new 3dsmax plugin. It works like a morpher, but on top of an animated mesh. it keeps the animation...modifiers, and the uv's. and the Source objects remains separate, so it'll not collapse it in one, like the boolean does. 1 : put the file in your script, startup folder.